Heat oven to 375°F. Spray 3-quart casserole with cooking spray. Cut each squash in half; scoop out seeds. Cut squash into 1/2-inch-thick slices. Arrange slices, overlapping slightly, in casserole. In small bowl, mix melted butter and rosemary. In another small bowl, mix granola and 1 tablespoon of the butter mixture. Brush squash slices with remaining butter mixture. Sprinkle with parsley, salt, pepper and granola mixture. Cover; bake 30 to 40 minutes or until squash is tender when pierced with fork. Uncover; bake 5 to 10 minutes longer or until lightly browned. Thyme or sage can be substituted for the rosemary. 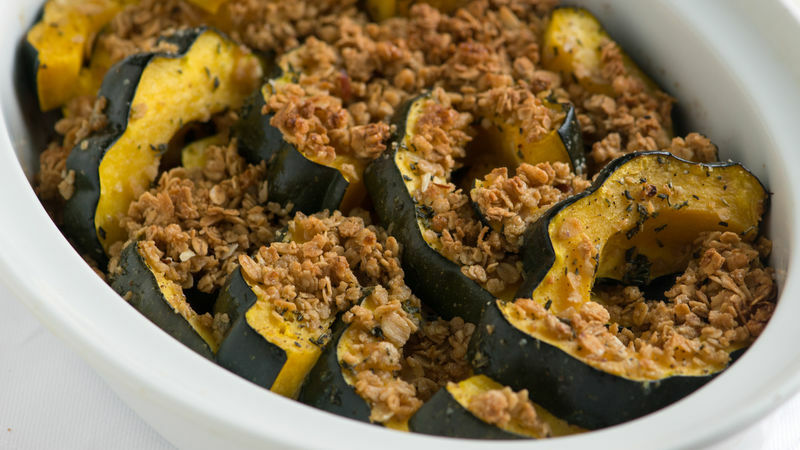 Try butternut squash instead of acorn squash.